The Big Apple in a little map! 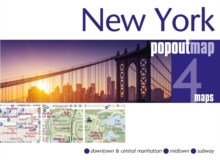 Get to the heart of NewYork with this handy, pop-up map. This New York map has been fully revised and updatedand includes a detailed map of Midtown.